When the chance came six years ago for Alice and Harry Gates to move from London to the Wiltshire countryside, they jumped at it, enticed by the amount of space on offer. Property: A Grade II-listed late-Georgian farmhouse, built in 1820 in Wiltshire. It is set in 300 acres. a spacious home studio to work in. The main goal for Alice and Harry was to ensure their four-square, traditionally laid-out home could function for their 21st-century family. Yet they also wanted to retain the period property’s original features and character. Finding that balance proved tricky, particularly given the limitations of listed building consent, which was required even for internal alterations. ‘We were permitted to add French doors in the kitchen, open up two rooms to create a playroom, and turn an upstairs bedroom into the children’s bathroom,’ says Alice. Once the house was rewired and replumbed, the couple also oversaw repair and remedial work, including replacing the mid-20th-century windows with designs more appropriate to the property’s historic character. Alice and Harry also considered knocking down the 1950s addition at the back of the house, but eventually decided to repair the existing structure, which consisted of a series of dog kennels, to create what is now a family-friendly utility room and a spacious hallway connected to the house by a glazed roof section. Alice had the kitchen cabinets made by Guild Anderson, then painted them in Georgian Grey from Dulux’s Heritage range. 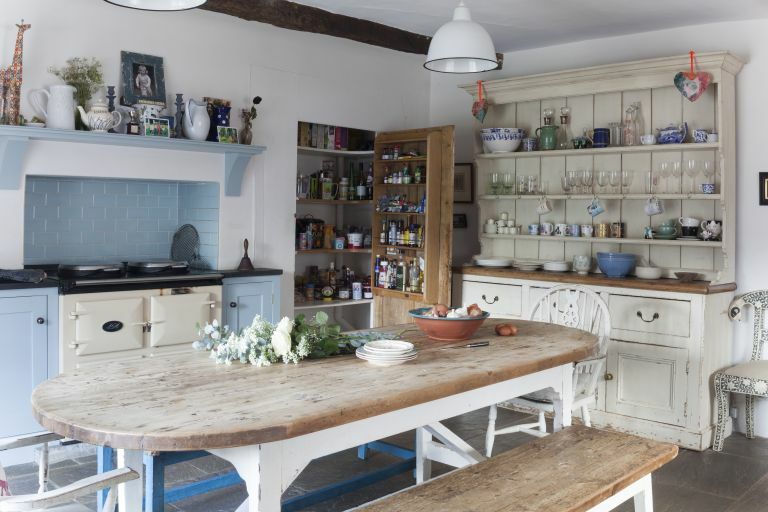 The old Welsh dresser came from Jack Harness at Arcadia Antiques, who also made the pine kitchen table bespoke for the family. Like many other families, the Gateses spend most of their time in the kitchen – which opens through to the bright living room – and it’s the space Alice is most pleased with. ‘It looks out onto the farmyard, where the children play, and is a really lovely place to be,’ she says. Alice designed the kitchen herself, choosing only single-level units in solid oak, which she then painted in a pretty blue colour. The biggest challenge was getting the task lighting right over the workspace, and her solution was to add some industrial-style wall lights that fit in perfectly with the eclectic look of the room. With a bespoke kitchen table in knotted pine, and reclaimed wheelback chairs, this room is representative of Alice’s approach to furnishing and finishing the entire house. An old Welsh dresser in the kitchen and the linen press and claw-footed baths in the bathrooms came from a local antiques shop, and traditional chairs are jazzed up with new fabrics throughout.